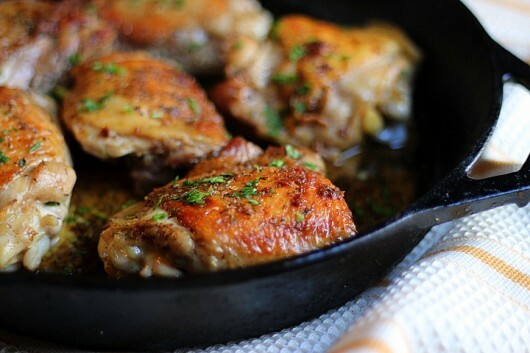 You can use all-thighs, all-drumsticks, or all-breasts for this recipe. Use a cut-up broiler-fryer chicken if you prefer a mix of dark and white meat. You’ll be happy to know that all pieces cook in the same amount of time, and that the breast meat, which normally turns dry and stringy when baked in the oven, will cook to juicy perfection when sauteed in a skillet. What kind of skillet? 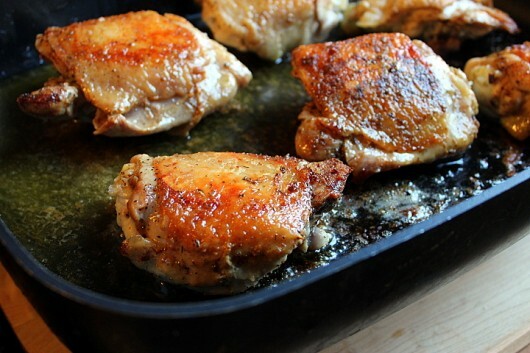 Well, if you are cooking just 4 or 5 chicken pieces, a 12-inch-diameter, cast-iron pan will do very nicely. But for a whole, cut-up broiler fryer, or for up to 8 large thighs, a 16-inch electric skillet — I use this one — is ideal. Enough small talk. Let’s saute our poulet! 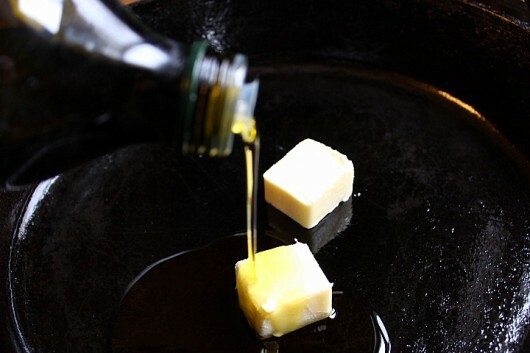 To start, put some butter and olive oil in a suitably-sized skillet, and heat them over a medium-low flame. If you are using an electric skillet, set the temperature to 250°F. When the butter melts, sprinkle some salt, pepper, and 1 teaspoon Herbes de Provence* evenly over the surface of the pan. This way, you won’t have to season the individual chicken pieces. *You can find Herbes de Provence at any decent supermarket. Look for it in the spice/dried herb aisle. Put the chicken, skin-side down, in the skillet, allowing a little air space between each piece. 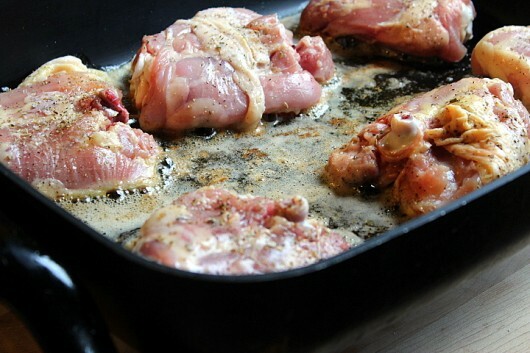 If the chicken is too crowded in the pan, the pieces won’t brown properly, and the skins won’t crisp. If you wish, you can sprinkle a tiny amount of salt, pepper, and herbes de provence on the exposed flesh. Now cover the skillet, and let the chicken sizzle quietly for 15 minutes. If the sizzling sounds are robust, lower the heat. Then remove the cover, and flip the pieces over. The skin should be crisp by now, and colored appetizingly. Cover the skillet again, and continue cooking until the pieces are done — 5 to 7 minutes. At this point, you can remove the chicken to a platter, and pour the pan juices over all. Garnish with fresh, minced parsley, and serve. 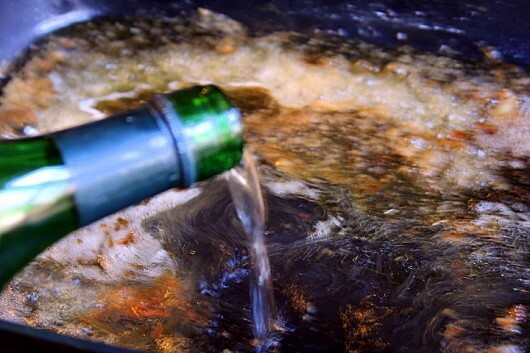 Or, for a more-sophisticated sauce, do what I sometimes do, and spill a splash of vermouth (or any white wine) into the hot skillet, and let it boil while you “deglaze” the pan. When you deglaze, you scrape up, with a heat-proof spatula, all the bits of meat and herbs which have stuck to the pan. If you are French, you can add a splash of heavy cream to the sauce. Let the sauce boil and reduce until it is thick enough to coat a spoon — about 2 minutes. Then either pour the sauce over the chicken, or just return the pieces to the pan. When you plate each serving, be sure to spoon some sauce over the top of the chicken, along with a pinch of fresh, minced parsley. Crispy outside, juicy and succulent inside, and perfumed with the invigorating scents of Herbes de Provence, these sauteed chicken pieces are THE BOMB. They’re also gluten-free and low-carb. For accompaniments, I’d go with buttered quinoa and a simple green salad. For wine, you can’t go wrong with a chilled Sancere from the Loire Valley of France. When sauteed in a skillet, bone-in chicken pieces cook to succulent perfection in under 30 minutes. I like to season them with Herbes de Provence for an exceptionally fragrant main course. 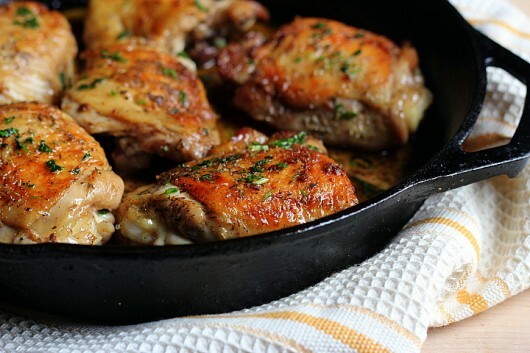 In a skillet that is large enough to hold the chicken pieces without crowding them, heat the butter and oil over medium-low heat. (If using an electric skillet, set heat to 250°F.) When the butter melts, sprinkle the salt, pepper, and herbes de Provence evenly over the surface of the skillet. Add the chicken pieces skin-side down, cover the skillet, and let simmer quietly for 15 minutes. Then turn the pieces over, cover the skillet, and continue to cook until the chicken is done -- about 5 minutes. The chicken is done when juices run clear. Remove the chicken to a platter. 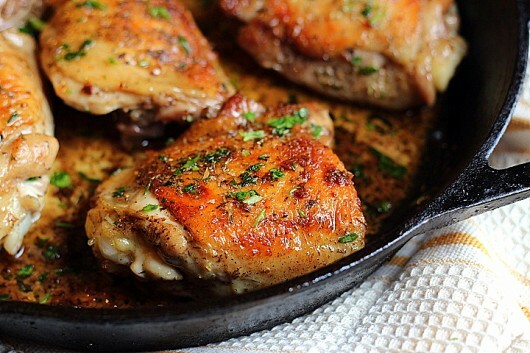 Tip the pan juices over the chicken, garnish with parsley, and serve. Or, if you'd prefer a richer sauce, add the splash of vermouth to the pan juices, and let it bubble while you scrape up, with a heat-proof spatula, the bits of chicken and herbs which have stuck to the pan. 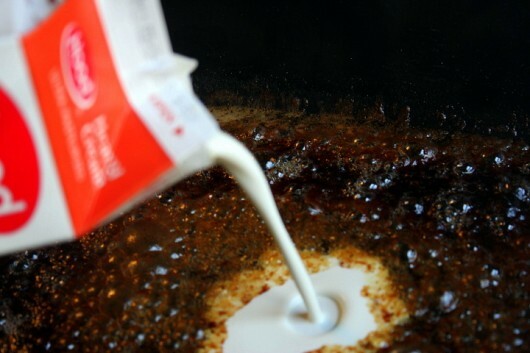 Then add the splash of heavy cream, and let boil and reduce until thick enough to coat a spoon. Pour the sauce over the chicken, garnish with the minced parsley, and serve. For the best flavor, be sure to use bone-in, skin-on chicken pieces. Are you a fan of “fast food” too? You can let me know by leaving a comment. And if you enjoy this feature, be sure to get my email updates! Thanks for the giggle over your fun “saute the poulet” rhyme. Just looking makes my mouth water. Chicken skin is so horrifying to the “Lets frighten people of food” crowd, but that’s where so much of the delicious flavor is. Will be doing this in the next few days, but might just go with fresh sage, thyme and rosemary. I shouldn’t admit this, but the thyme I winter-sowed LAST year is still in its milk carton with the top cut off, still growing like it means it, and still flavoring my food. I never got around to pouring the steppingstones around which I had intended to plant the thyme. I really should cut up the mass and pot up a dozen or so to be ready for the garden come spring. I absolutely need one of those electric skillets as I’m always overcrowding the pan. In the meantime I’m pulling out a smaller portion of bone-in thighs from the freezer to make this tomorrow night. My mouth is watering already. How much is a splash, Kevin? Would white wine and heavy cream be okay together? Hi Badger Gardener – Enjoy this quick dish! 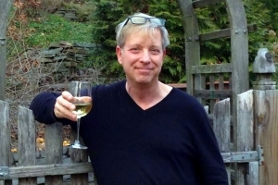 Hi Marie – White wine and heavy cream are a delicious combination. A “splash” for me is 1/4 to 1/3 cup. But you can add more or less wine or cream depending on how much sauce you want. My 17 yr old often does something similar when she gets to the dinner/lunch table and discovers food she doesn’t like. I’m amazed at how fast chicken cooks up this way. Your method will provide a nice taste variation for her. [Though she’ll probably continue to drop a few pickled lemons in.] Thanks! Yay for Alice B Toklas! And she lived to be around 90 eating chicken skin, butter and sauces made with heavy cream. What she wasn’t abusing her body with were so-called foods that require chemical experiments on lab rats before being approved by the FDA. Most of the food police are charlatans who make wads of money selling books that scare people to death of eating things humans have been eating since we were a hunting and gathering people. A neighbor handed me a book last year that is the worst of the worst. This guy blames everything from hangnails to terrorism to a bad hair day on foods made from wheat. Okay, maybe that was hyperbole, but he attributes just about every ailment known to mankind on wheat consumption. Not only that, but he spelled farro, an ancient type of wheat, faro, the gambling game. Spare me. Keep giving us real food with good, fresh ingredients, Kevin, the food police be hanged! Kevin, we had this chicken for dinner tonight and it was amazing! I used boneless chicken breasts. Although I use Herbes de Provence in other dishes I had never used it in chicken. Next time I might try the vermouth and cream method. Thanks! I recently stumbled upon A Garden for the House and am beyond thrilled with my discovery. 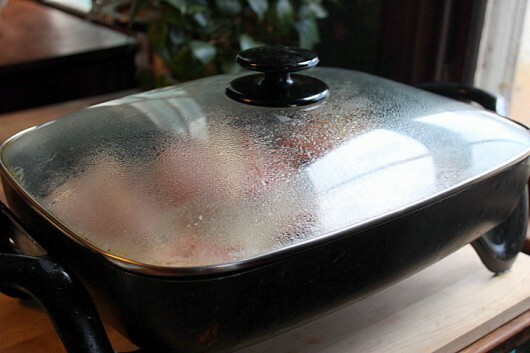 My mother used to cook chicken pieces this way, in a cast iron skillet and it’s domed stainless steel lid, taking each piece out as it was done, and popping it into a warm oven, onto the platter that came to the table. So simple. I’d forgotten all about it. Real food, including skin and bone. The best meat being that closest to the bone, so to my tastebuds, the wings were prized. The cast iron shillet lived on the stovetop. Gas stove. After each use it was quickly washed and put back on the stove with a flame under it, for a couple of minutes, to dry it. Eggs, grilled cheese sandwiches, stews, so much cooked in that family sized skillet. Thanks Kevin. I can hardly wait to try this. I refresh my Herbes de Provence spice jar every year with herbs from my garden (I purchase the fennel seeds) but use them infrequently. I never hesitate to try your recipes. They are ALL “keepers”! 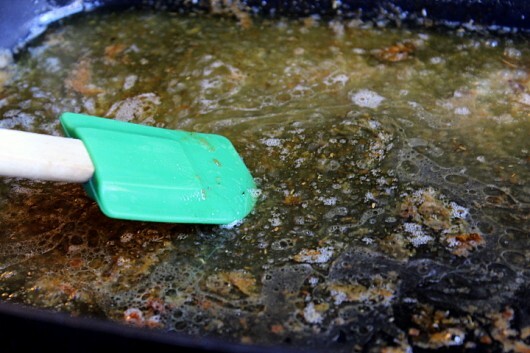 another question….what kind of electric skillet do you use? 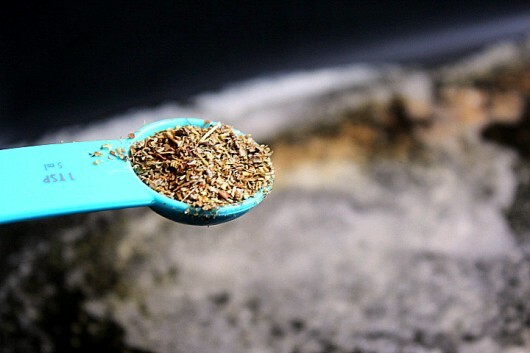 What are the herbs in Herbes de Provence…besides fennel? Hi Melissa – You can simply pour the pan juices over the chicken, and omit the wine and cream. To read about my electric skillet, click the highlighted text in the third paragraph above. Hi Elizabeth – Herbes de Provence is a mixture of savory, marjoram, rosemary, thyme, oregano, and sometimes other herbs. You can make your own if you wish, or buy it in a jar at any decent supermarket. You’ll find it in the spice/dried herb aisle. I am French, and your recipe is truly delicious and a favourite among us ‘ French people ‘….. You are fabulous.. Love all your recipes….. MERCI BEAUCOUP. Thanks for this good recipe. I am not French, but when I read about the addition of the cream I changed my nationality to French. Well worth it. Oh my goodness! I haven’t found a bad recipe yet! Do you have good recipe for cornbread? Excellent for spontaneous dinner guests – menu suggestions also…. Chicken thighs with skin on is my most typical meat and can be served so many different ways. I often add dried cranberries, almonds, slivered or sliced, sliced scallions to my quinoa a bit of butter too. You can never go wrong with this. Thanks again. Planted my amaryllis bulbs yesterday – can’t wait for the show. Now that’s what I’m talk’n about!!! Yha, Kevin. I just made this for dinner! I thought I had the herbs de provence, but when I was ready to add it to the oil & butter, I didn’t! So I looked up the separate ingredients from an above post, mixed about 1/4 tsp each, and threw it in. I must say, it was DElish! My husband loved it to. This recipe is going into my rotation. Thanks Kevin, another hit! Last weekend at the kitchen store we were putting together a list of items we thought we should look into stocking. I put your book on the list, so please be sure to let us know the moment it is out who publishes and distributes it so we can order some. I will be great at selling it in Middlebury because I have used so many of your recipes. I am so excited for you. Hi Kevin I’ve been doing a variation of this for years and my kids just love it. I use boneless, skinless chicken thighs, that I season on both sides with basil, thyme, and Bombay Veggie Blend. I fry them in a large frying pan with olive oil, when their almost done I add a goodly amount of orange juice and finish cooking. The juice evaporates and thickens into a beautiful sauce that I spoon over rice. Bombay Veggie Blend was a Frontier product, it’s a blend of coriander, chili peppers, fenugreek, cinnamon, cumin, cayenne, black pepper. Unfortunately it appears to be discontinued, so I’ll have to make up my own version. I making it now and it smells divine! Had to turn the heat,up in my electric skillet,as at 259 degrees, nothing was happening. I’m pan frying cubed sweet potatoes and having spinach and a fruit salad with it. Had this for supper, with duck fat roasted potatoes, carrots and mushrooms cooked in chicken juices. Made sauce with white wine, scratching a from the skillet and cream. Also made Yorkshire pudding. Delicious and the chicken was moist and flavourful. Anne in Vermont – Thanks so much. 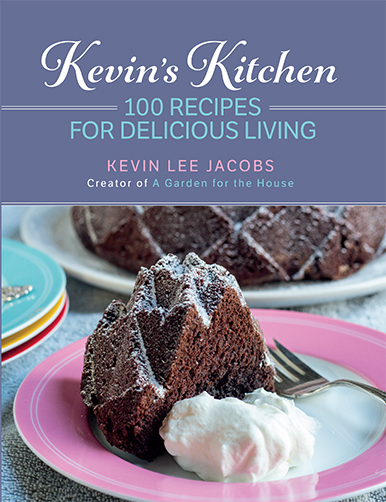 I’m hoping (and hoping, and hoping) for a December, 2016 publication of the cookbook. Hi Christine, Karen, and Janice – Thanks for the reviews. So glad the dish worked out for you! This was just the thing after a day’s skiing. So easy, so tasty. I even made my own Herbes de Provence so I’ll have them at hand for the next time. If I had to change anything, I’d use less fat in the pan as the chicken with skin rendered a fair bit. Otherwise, perfection on a plate. Perfect timing-just the answer for upcoming dinner party. I was drawing a blank on what to serve and life’s busy schedule wasn’t helping. So just made 2 batches of butter(so easy,) saved the buttermilk to go into the mashed potatoes, and have a big electric skillet for the chicken. Salmon in puff pastry for starters, and salad of baby greens,berries,& feta plus maybe some roasted veggie will fill the bill. You’re a lifesaver! Party over, chicken provence a winner & homemade butter was served on hot sourdough loaf. I used a super big electric skillet which rarely get used & added sliced mushrooms, vermouth, a little stock & cream. Never had such juicy chicken-fabulous! Now the nice big skillet will have new life. I look forward to all your postings. Kevin, this has been the second time I have made this – truly easy and tasty. Served with fresh asparagus from the garden….. yes, it is the season here in Virginia. Kevin, I am french and I have my heroes de Provences sent from the south of France everytime I have the opportunity. It is the best for poultry. Hi Gerda – Ah, herbes de Provence from the south of France. I’m jealous! I get all my dried spices, black peppercorns etc. and vanilla beans from My Spice Sage.com. I live in a very small town in Ala and some of the dried spices are non-existing here. THANK YOU so much for such an awesome recipe! It was nice to have a precise printed recipe for my assistant. I prepared this for the Ladies Who Lunch yesterday and they loved it! The pan gravy was awesome; I used a white from Gascony and it paired perfectly with the chicken and brought out the lavender flavor in the herbs. The endive-Apple-Walnut salad was delicious but not a huge hit; that’s OK because we ate it last night, heh heh. for years, but I am betting that your recipe, will become the next winner. I’ll add the cream too. This is so superior to the typical fast food chicken! Real food for a real treat. Thank you for the recipe, and I am also looking forward to your cook-book. Have to try this- work nights and always a struggle to get supper fixed before I go to work. I really enjoy your blog Kevin! Do you have a ShopRite grocery store near you, Kevin? If so, you might want to look for tray packs of Simply Essentials chicken. These birds are being fed a diet which includes flax to increase Omega-3 fatty acids, are antibiotic free and air chilled during processing to avoid water uptake. I think the taste and texture is “The Bomb”! We like to use herbes de Provence on chicken, too. Great recipe, Kevin! It works perfectly on my Keto diet! Buttery cabbage on the side, yumm. We’re in the midst of kitchen appliance repairs, so I am happy you reminded me of my long-forgotten electric skillet. Kevin saves the day!